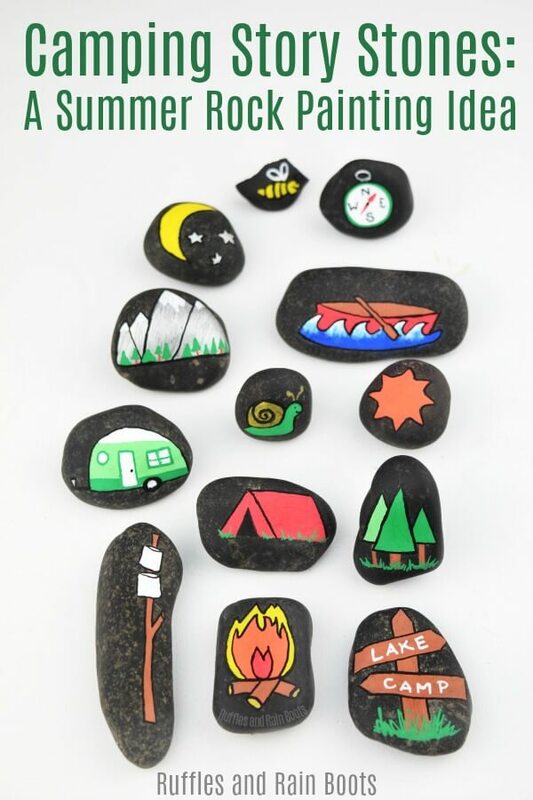 Camping story stones are a perfect addition to your summer camping gear. This is a great rock painting idea for beginners to make because we’re sharing two ways to make them! Let’s get started making the gift of storytelling. Earlier today, I planned the year’s worth of camping excursions. I spent the day reserving campground sites, planning hikes and day trips, and really deciding how long I can really go without a shower. After all that planning, I needed a break; I needed something relaxing. So once my tasks for the day were accomplished, I got out my favorite paint pens and some black rocks to have a little Rock Painting 101 fun. Note: if you don’t want to draw and paint your own story stones, scroll down – I’ve got you covered! It’s one of my daughter’s favorite ways to DIY story stones. Kids are storytellers and story stones are a simple way to build on that skill. Because I had camping on the brain, I decided to make my daughter a set of camping story stones we can throw in the gear and have for any trip. In my kit I included the following stones. Can you guess my daughter’s favorite camping activity? During one camping trip, the kids were impatiently waiting on the grownups to build a fire, so we taught them how. At 6-years-old, my daughter knows how to build a proper fire. 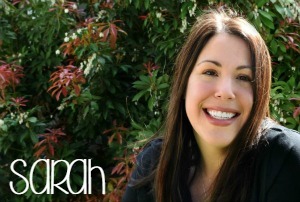 Her driving focus in learning how to build a campfire was for toasting marshmallows. We let our kids go a bit feral when camping (isn’t that what it’s for? ), so by day 3, we want everyone to find the nearest body of water. 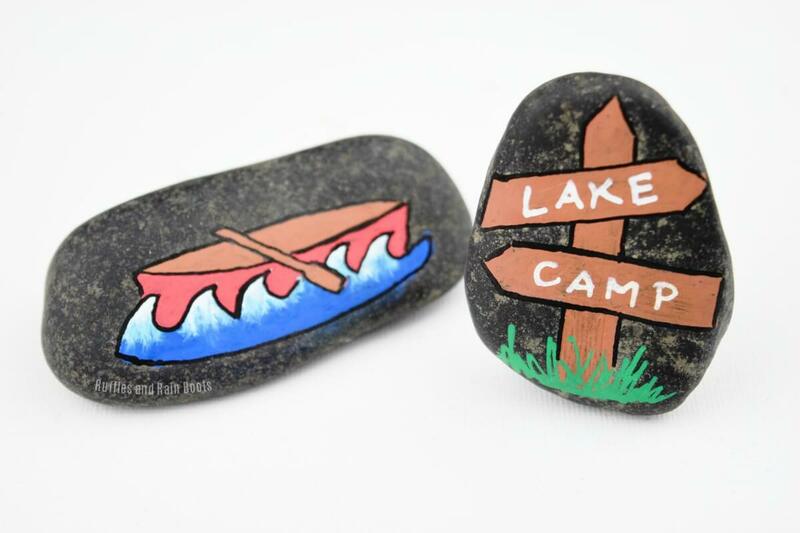 These signpost and canoe rock painting ideas for kids are sure to please the little ones because they know what’s at the end of that trail! For a video of the canoe, keep scrolling – it’s short and teaches you how to blend paint pens using the wet-on-wet painting technique. We’re in Washington and the camping around here is ah-may-zing. From mountains and old-growth forests to glacier lakes and rainforests, we have no shortage of landscapes. Our next trip is over to Mount Ranier, so I made these camping story stones to give her options. I suppose I should add a meadow and a glacier! Tent camping is a childhood milestone. 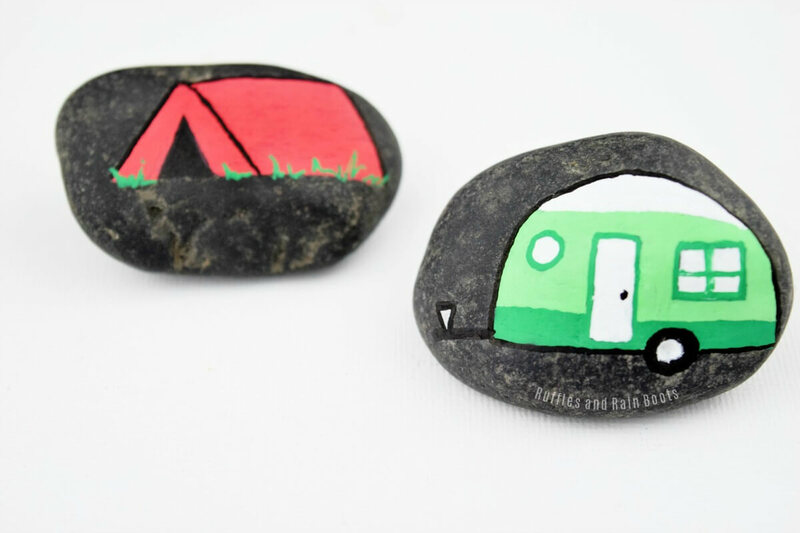 Whether you’re in the city or travel far distances to pitch, the tent painted rock is sure to bring smiles. You could also include sleeping bags or hammocks. Inevitably, someone always gets stung or slimed on our trips. 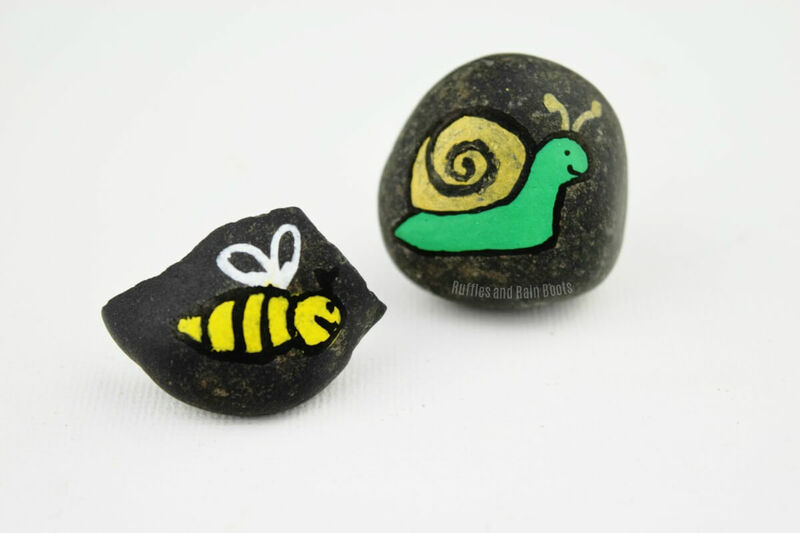 I’ve included this bee and snail, but other great bugs for camping rocks are mosquitos, butterflies, caterpillars, and beetles. 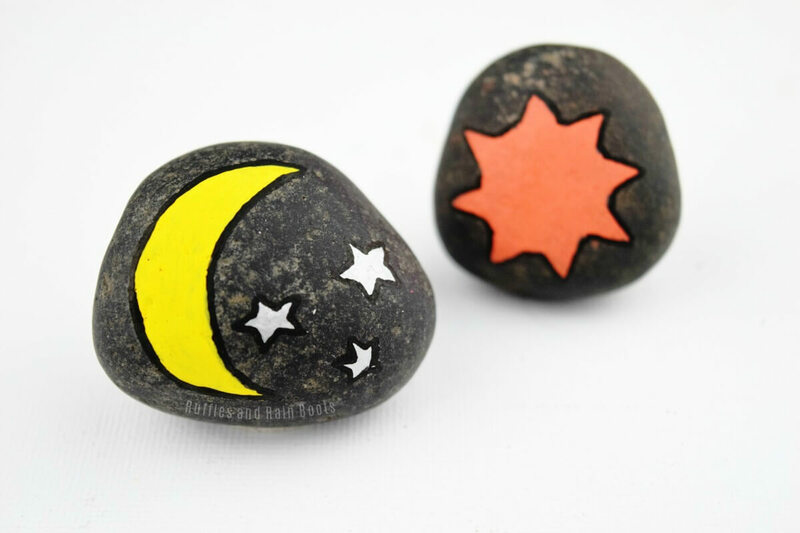 We made these weather story stone rocks so for this set, I kept it simple with just a nighttime rock painting and a sunshine rock. This quick tutorial will tell you how to blend paint pens using a wet-on-wet painting method. It’s a fast technique and really comes in handy. In this short video, I’ll show you how to blend water. 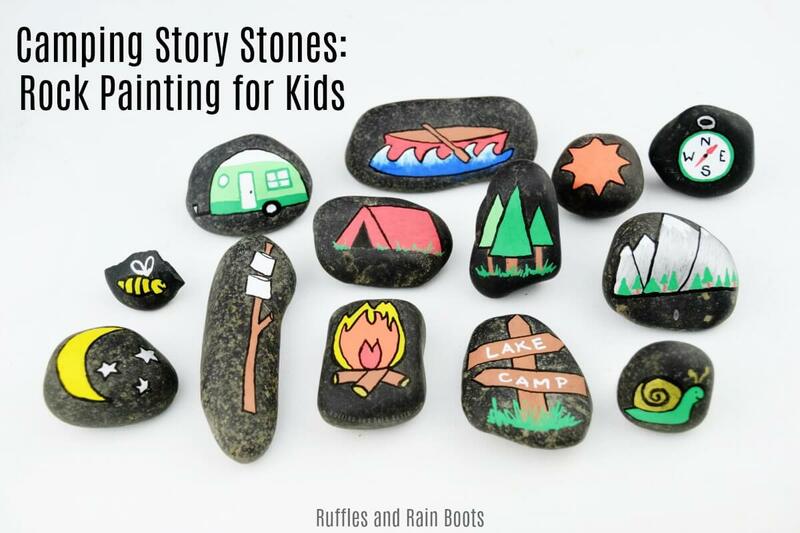 Just like our Christmas Story Stones, kids of all ages can get in on pebble painting fun! 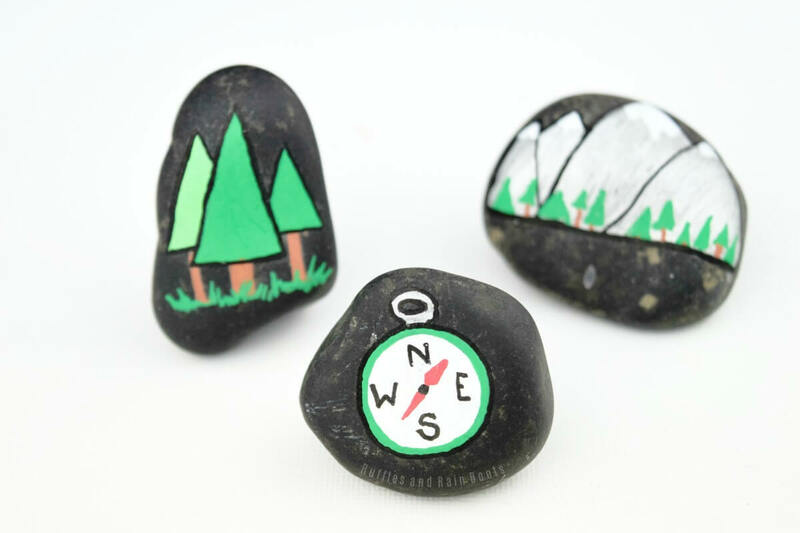 If you (or your little one) aren’t confident in your drawing skills, you can print off clipart, cut it out, and use ModPodge to attach it to rocks before sealing. For a full tutorial, just follow our Christmas story stones how-to. As an Etsy seller, I like to share other artists’ work from there, and this camping clipart caught my eye. Psst: they’re only $1! 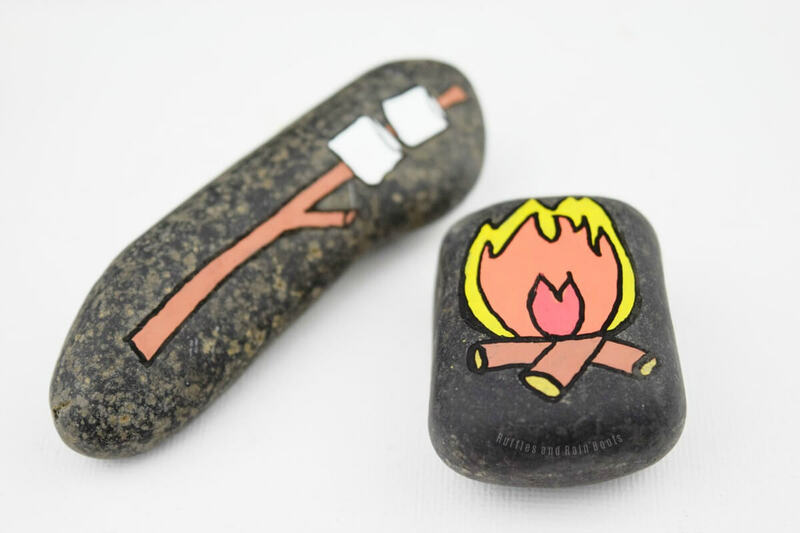 How will you make your camping story stones? I think I might print off that clipart (yes, I bought it) and make the neighbor boys a set for their big 3-week camping trip this summer. Please share this on Facebook in your favorite rock painting group. Your shares are how we grow and we’re sincerely grateful. My daughter would love this activity. Just today she fell asleep in the car and I found about 10 rocks in the back seat. OMG, she is always collecting little trinkets. This would be a much better way to use and display her rock collection that to just have them stored in the backseat of the car! Thanks for the idea. What a great activity for kiddos! Such a fun thing especially for making a camping fairy garden.